One of the biggest breaking stories this weekend involved Facebook, and its lack of action regarding misuse of profile data harvested by Cambridge Analytica (CA for short). A whistleblower, Christopher Wylie, who worked for CA described how the firm "exploited Facebook to harvest millions of people's profiles. And built models to exploit what we knew about them and target their inner demons". Why would a firm be interested in this kind of manipulation? 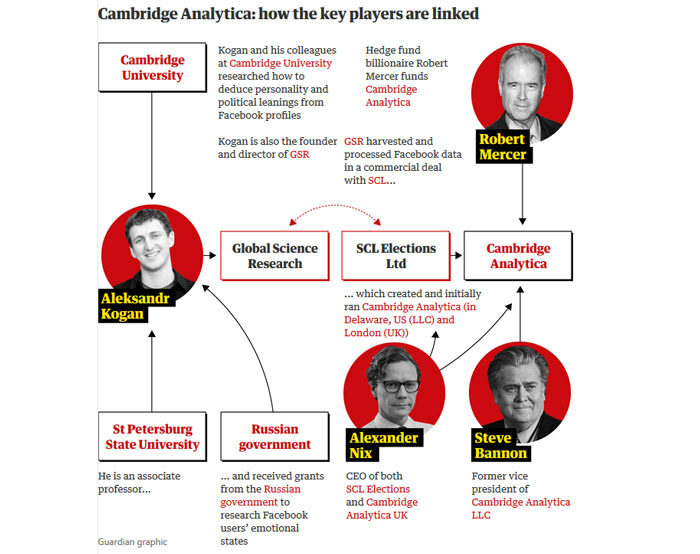 One answer is that Cambridge Analytica is owned by hedge fund billionaire Robert Mercer, and was headed at the time by Trump's key adviser Steve Bannon. The 'analytics' firm was employed by the Trump election and Brexit campaign teams. In case you are wondering, Christopher Wylie didn't hold a junior position at CA, he helped found the firm and worked there until 2014. In 2014 a Facebook app called 'thisisyourdigitallife' prompted the social network users to answer questions for a psychological profile. The app was written by academic Aleksandr Kogan, through his company Global Science Research (GSR), in collaboration with CA. The Guardian reports that "hundreds of thousands of users were paid to take a personality test and agreed to have their data collected for academic use." However, the app also collected data on test-taker friends, thereby gathering a data pool tens of millions-strong (approx 50 million). Facebook's platform policy only allows data collection of willing subjects to improve user experience. In 2015 the 'thisisyourdigitallife' app was blocked, and in August 2016 Facebook asked Wylie to destroy any data he held that had been collected by GSR, the company set up by Kogan to harvest the profiles. Apparently, Facebook didn't follow up its request. Wylie explained the continued (mis)use of the data by those that used CA, to the NYT, as follows: "Rules don't matter for them. For them, this is a war, and it's all fair. 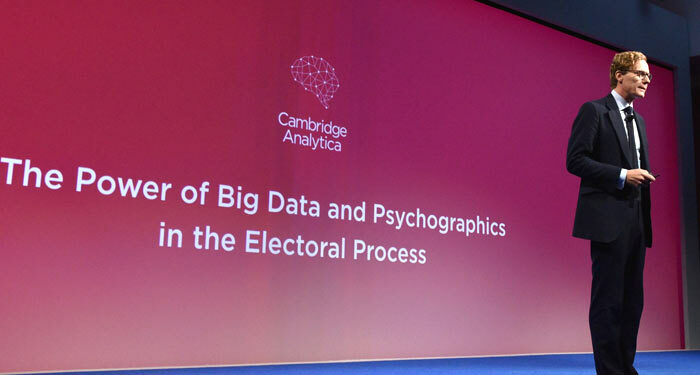 Cambridge Analytica was supposed to be the arsenal of weapons to fight that culture war." With twin explosive reports published at the weekend in The Guardian and The New York Times, today we have seen official statements from various governmental organisations about what they will do. Here in the UK, a spokesperson for PM Theresa May said "The allegations are clearly very concerning. It is essential that people can have confidence that their personal data will be protected and used in an appropriate way." The spokesperson added that the Information Commissioner is investigating and expects full cooperation of Facebook, Cambridge Analytica and any other companies involved. Meanwhile EU lawmakers are to start an investigation into whether the data of more than 50 million Facebook users has been misused. In the US there have been calls in Congress to enforce stronger personal data safeguards. "It's clear these platforms can't police themselves," Democratic U.S. Senator Amy Klobuchar Tweeted. Andrew Bosworth, a Facebook VP, hinted the company would do more to protect user privacy and prevent future misuse of data. "We must do better and will," he wrote on Twitter, adding that "our business depends on it at every level." You can read Facebook's official views on the Cambridge Analytica situation here. TBH however the data is collected I'd like to see a blanket ban on ‘personalised’ political advertising as it's only likely to widen the gap between political promises and reality. Being able to serve divergent (or even directly contradictory) messages to different target groups is just not going to end well from politicians who already struggle with the lexical difference between ‘true’ and ‘not provably false’. Given that a government simply cannot create a ‘personalised’ product for each citizen once in power they shouldn't be able to advertise different policies to different citizens in an election campaign. Perhaps we should all just wait until 25th May and then request a copy of all the data they hold on you so you can ensure it is up to date and correct under GDPR. Then once you have a copy politely ask for all data to be deleted and forgotten. You don't have to wait till the 25th of May to perform a Subject Access Request.